« There Goes The Camel! “What did I do that was wrong?” I asked. The Trooper replies “I’ll be right back.” He takes all my paper work and returns to his car and leaves me sitting and hoping that he loves Jesus too. Surely he will appreciate our devotion and love for God! He’s an Atheists! He doesn’t love Jesus! He handed my two pieces of paper. One was a ticket for speeding and the other was a warning citation because our (ex) youth pastor didn’t sign the back of his car registration! Really!?? I was speechless! He obviously doesn’t love Jesus, and He enjoys persecuting those who do! 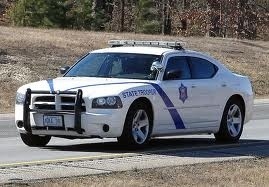 The Trooper informs me of my court date and as he turns to walk away he says “Oh, God Bless!” Blasphemy!!! There are several lessons to be learn from this experience. First, sign the back of your car registration. I believe that’s why he gave me a ticket for speeding instead of a warning ( I’m sure it had nothing to do with me speeding). Second, why do we feel the need to use our Christianity for personal gain? We play the Christian trump card to get out of trouble or to get the upper hand. Does our Christianity serve us or do we serve Christ? Did Paul say that he was following Christ because of personal gain or did he say “what was gain to me I count loss, that I may know Him?” Do we believe in Jesus so that we can have a better life or do we follow Christ because He is Life? Wearing the cloak of Christianity for personal gain is a form of idolatry. The truth; I was speeding and guilty of breaking the law. I was not speeding on purpose but I deserved a ticket and I was wrong for hoping my good deeds would out weigh my wrong. It doesn’t work that way with God, why am I surprised that it didn’t work that way with the State Trooper? But thankfully God is merciful and forgives our trespasses through Christ. If you feel lead by God to help pay my speeding ticket……let me know! Just so you know, the State Trooper was very nice and professional! I appreciate our law enforcement officers very much. We have several in our church family and they are a blessing to our church! This entry was posted on August 13, 2013 at 8:33 pm and is filed under Blogs. You can subscribe via RSS 2.0 feed to this post's comments. You can comment below, or link to this permanent URL from your own site.